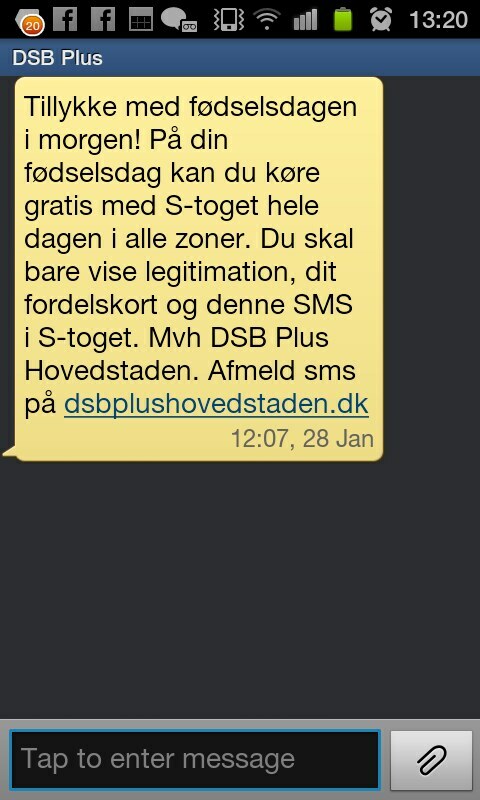 I just recieved a quite brilliant text message from Danish State Railways. "Congratulations with your birthday tomorrow! You can travel free in all zones on the S-train (the trains serving Greater Copenhagen) on your birthday. Just show your ID, your DSB loyalty card and this text message on the train." This is brilliant customer care. Free trains on your birthday! I'm stunned and pleased. This is back when they made it free to take your bicycle on the trains. This is their idea of having bicycle pumps on their trains.